Ever since I was conspiring with Lady Ursula about Saxony garb for Eva (including the obligatory looking at all of the portraits of gorgeous garb), I’ve been keen on making a Saxony gown of my very own. After all, as Ursula pointed out, green and orange are key colours in this period and, therefore, I must be destined to wear one. On top of this point, it was the brilliant hat (which I refer to as the ‘trapezoidal flower hat’, as depicted on my sketch and in portraits below) with ostrich plumes that were SPANGLED down the spine (that’s right, ALL of the shinies!!!) that sold me on such a project. Furthermore, the stars aligned and, as well as having an opening in my busy project schedule, there was also a Kingdom Arts and Sciences competition for Midwinter being hosted here in my home Barony of Politarchopolis for: “Court Garb (From any period, special attention to recreating all the layers)”. Finally, my laurel Mistress Mathilde, and my newest apprentice sister, Ginevra, were also enthusiastically on board so that was that. Saxony, a region in Germany, in the first half of the sixteenth century had a specific style of court garb. 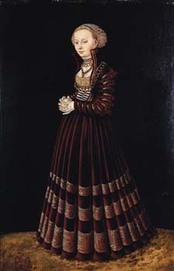 This style of gown is often referred to in literature as the Cranach gown, named after the artists Lucas Cranach the Elder and Lucas Cranach the Younger – a father and son duo who painted prolifically in the late fifteenth to mid sixteenth centuries, and included many paintings with this distinct style of gown. Having said that, many other artists painted this style of gown at the time, such as Hans Baldung and Hans Krell (as outlined online in this introduction to Costume in Saxony by The Friesian Frock Girl). Ginevra and I have been looking through as many portraits as we could possibly find. Thanks to Ursula, the Cranach Digitial Archive was searched (which has great for getting in close to portraits). 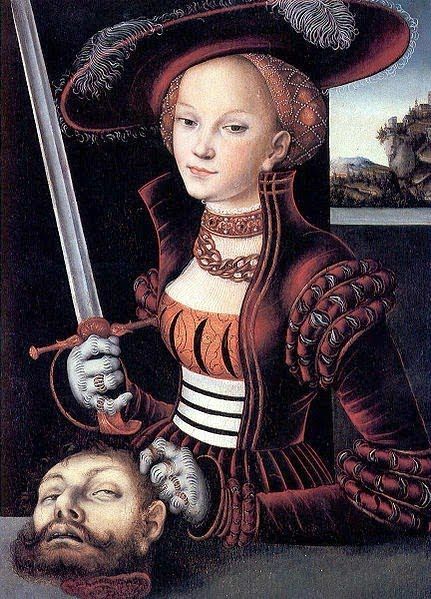 Mistress Francesca also pointed me in the direction of searching through the Web Gallery of Art for more portraits by the Cranachs’. Countless web and book browsing later (books courtesy of the libraries of Mistress’ Francesca and Rowan), I had many ideas for what I liked in the Saxony style. Following this initial research, I drew a plan for what outfit I wanted to create. My first sketch, and the portraits inspiring the design elements, are depicted below. 5. The hat shape is inspired by portraits 4 and 5. The spangle-ification of the feathers is inspired by portraits 5 and 6, and the use of black feathers is inspired by portrait 6. 6. The use of goldwork as decoration instead of brocade/braid trimming is inspired by portrait 7, and the pattern is inspired by portrait 1. 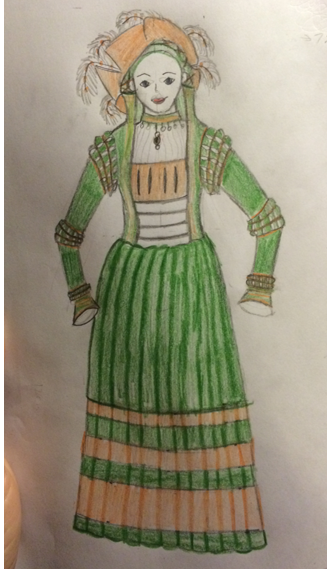 Saxony Dress Concept Sketch – drawn by Ceara Shionnach, January 2014. The sketch I made, combining various elements of Saxony court garb from portraits. Image drawn by Ceara Shionnach, January 2014. Portrait 1: Image sourced from It’s About Time. Image source: It’s About Time, 2012. Portrait 2: image sourced from Sophie’s Stitches. ‘Portrait of a Lady with an Apple’ by Lucas Cranach the Elder, 1527. Image source: Sophie’s Stitches, accessed January 2014. Portrait 3: Sourced from Wikimedia Commons. 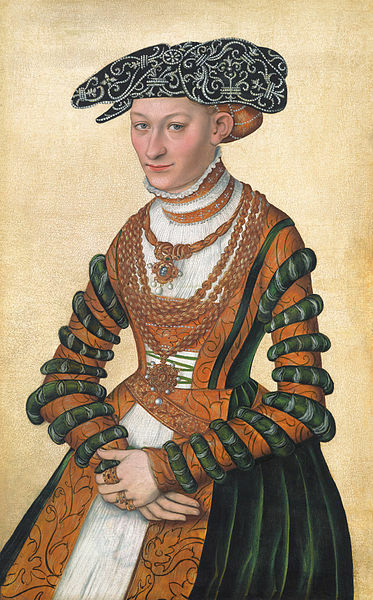 ‘A Lady in Green Velvet and Orange Dress and a Pearl-Embroidered Black Hat’ by Lucas Cranach II, c1541. Image source: Wikimedia Commons, 2011. Portrait 4: Image sourced from Wikimedia Commons. 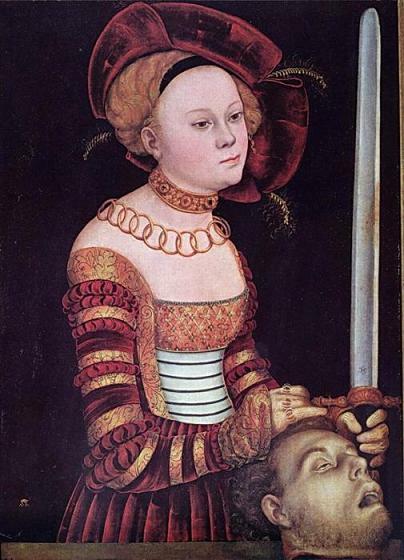 ‘Judith with the Head of Holofernes’, Lucas Cranach the Elder, c1530. Image source: Wikimedia Commons, 2012. Portrait 5: ‘Christ Blessing the Children’ by Lucas Cranach the Younger, 1551, as published in the Cranach Digital Archive (accessed January 2014). Take note of the woman in middle back in red dress with black feathers in hat that appear to have gold spots (which may be spangles) along the spine. Portrait 6: image sourced from Sophie’s Stitches. 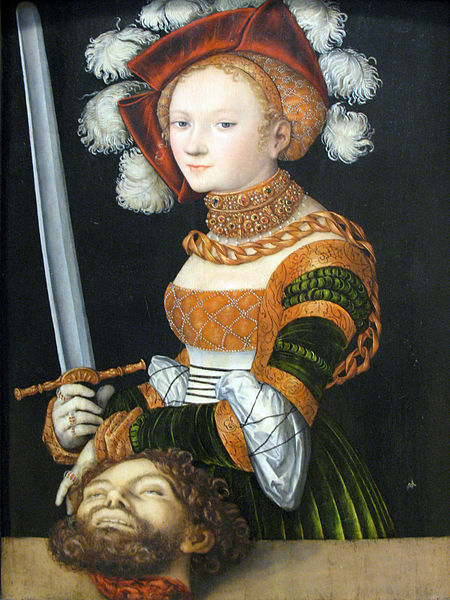 ‘Judith with the Head of Holofernes’ by Lucas Cranach the Elder, c1530. Image source: Sophie’s Stitches, accessed January 2014. Portrait 7: ‘Hercules with Omphale’ by Lucas Cranach the Elder, 1537, as published in the Cranach Digital Archive (accessed January 2014). Take note of the woman on the right in green, who appears to have lines of gold twist couched on her gown. The next step in this process will be to map out the materials and project schedule. Thankfully, I already have some delicious fabric lined up for the gown (see below, thanks to Mistress Mathilde). There’s even a swatch of the orange silk brocade in the middle there, which will likely be the colour of the hat. 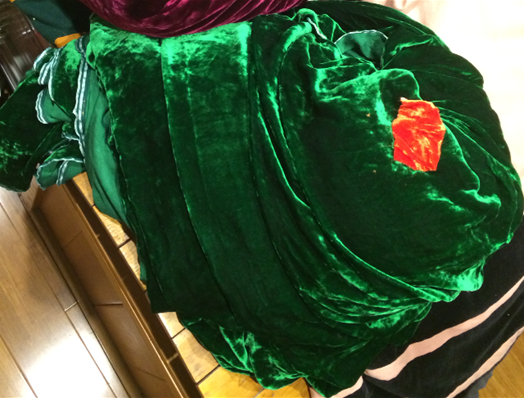 Green and orange silk velvets, a gift from my delightful laurel Mistress Mathilde in January 2014. FANTASTIC! So lovely. I’m totally enamored with the black feathers with the spangles.